This everyday bag is made from cotton canvas, sturdy and durable material. It is roomy and big enough to hold lots of your essentials and pocket books. It's a color that goes with everything. .... 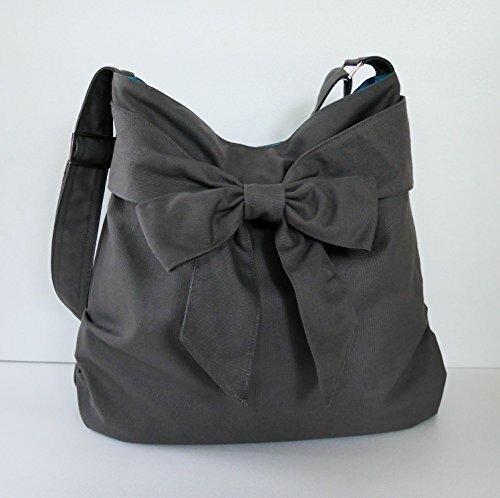 Exterior : Grey canvas - 1 zippered pocket on the back.... Interior : Teal canvas with 1 big zippered pocket, 2 opened pockets, 1 pen slip and 1 swivel clip --- Strap length is adjustable from 27" up to 48" and it's 1.5" wide. -- Our studio is pet free and smoked free area. Made in Thailand. --- Please hand wash the item in cold water. If you have any questions about this product by Virine, contact us by completing and submitting the form below. If you are looking for a specif part number, please include it with your message. Women Purse Vintage Genuine Brown Leather Cross Body Shoulder Handmade bag Pre Valentines Day Special Sale!